I returned to work this week after being off sick since June 15th with a horrid respiratory infection. Not much to do when your home sick with no energy to move, but watch TV and read, but during this time I discovered and fell in love with a whole new world. The world of "Hogwarts", a school for witches and wizards. I've seen all the Harry Potter movies and enjoyed them very much. The 7th and final book is being split into two movies, one being released this November, and the last, July 2011. I have all the released movies and watched them all once while I was sick, and then watched them all again. Then I remembered that a friend had lent me the first four books of the series, so I decided to start reading them. I assumed the books were going to be a little different then the movies, but I was really surprised at how much. So much more information is in the books that I found that I after I read all the books I enjoyed the movies even more! Once I started reading this series I didn't stop, I read the entire seven book series in just under two weeks. Thankfully my teenage neighbor had books five and six, which I thought I had, and Rob's brother had lent me book seven, the final in the series. 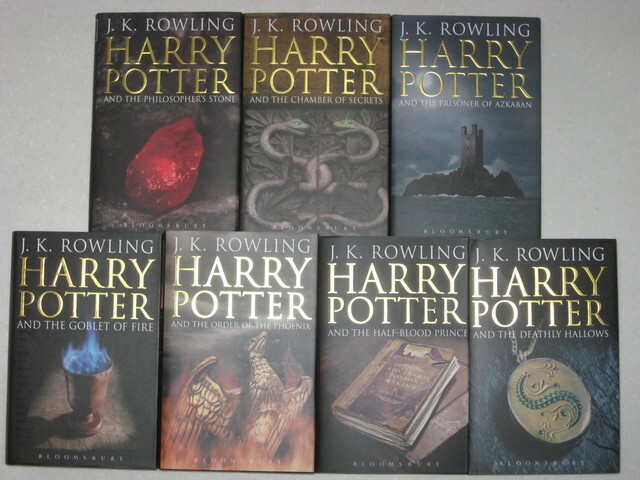 I plan on buying myself the hardcover set in the future, I know I will want to read them again. J.K. Rowling created a whole new world of witches, wizards and magic that really appealed to the child side of me. I don't remember ever being so consumed by a book. The characters in the stories are engaging, and I'm sure everyone has their favorite good and bad guy, for me it was Ron Weasley, one of Harry's best friends, and the evil person I loved to hate the most was Ms.Umbridge, who worked for the Ministry of Magic and taught one year at Hogwarts. I loved how characters kept turning up in the different books, and you felt like you really got to know them as the series spans seven years. I also enjoyed how much the children's pets were involved in the stores that didn't come across in the movies. 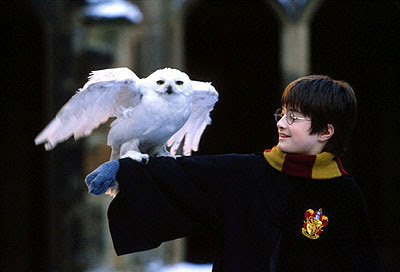 I cried like a baby when Hedwig, Harry's pet snowy owl,(who was a birthday present to him from Hagrid when he turned 11 in the first book) died in the last book. There was also one character, Severus Snape, who kept me guessing til the end if he was good or evil. But these stories are about so much more then good versus evil, there about friendship, loyalty, and acceptance. And hey, if that comes with loads of magic, flying brooms, and owls that deliver mail, even better! After all, who wouldn't want a magic wand to wave around to get all the house work done or walk into a fireplace with some "Floo Powder" to zap yourself somewhere else you want to be. I know this story is suppose to be for kids, but I know of a few other adults who enjoyed them as much as I did and if you haven't read them, I suggest you give them a chance. I'm going to Orlando, FL, this coming October and "The Wizarding World of Harry Potter" theme park opened at Universal Studies this June. I'm going to get a chance to visit the village of "Hogsmeade" and try "Butterbeer" at the "Three Witches" tavern, buy a wand at "Ollivanders" (it chooses you!) and mail a postcard at the "Owl Post" post office. I'll also pick up some "chocolate frogs" and "every flavor beans" at "Honeydukes" and loads more, right out of the story. I've been wanting to do a Orlando trip for years and go to Disney World, and it just happened to end up being this October that my brother and his family in Calgary decided to plan a trip there and I will be joining them. Coincidence that it's also the same year the Harry Potter park opened in Orlando? Maybe....but I like to think it was fate. Sounds like you had good company with Harry and his pals. I've only seen snipits of the first couple movies... maybe over the winter we can watch them? Like one per weekend? And, maybe when I retire, I will read the 7 books? Or start reading them now and finish them when I retire?